﻿ CSR : Environment : Environmental Aspects (Environmental Burden)｜Japan Display Inc.
Our business activity consists of inputting energy and resources to create products, which are accompanied by outputs such as CO2, waste, and so on. These inputs and outputs are regarded as environmental aspects within ISO 14001. An overview of this is shown in the figure below (covers all domestic plants + overseas manufacturing subsidiariesin FY2017). The basis of our environmental improvement activities lies in reducing the amount of inputs and outputs, and we work to address such activities by determining each of these items for every area in a detailed manner. 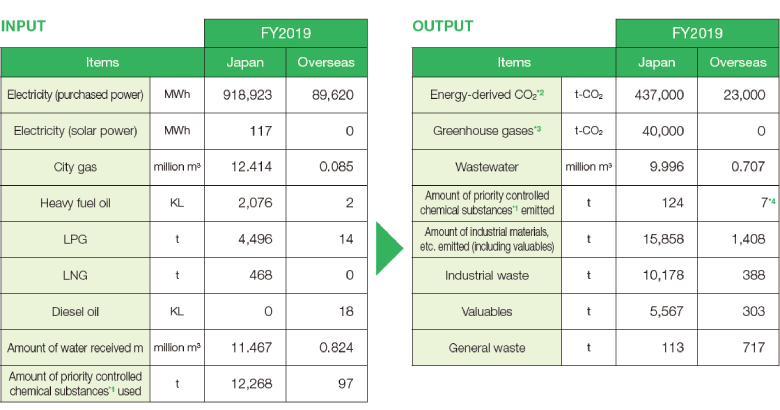 *2:The CO2 emissions coefficient from electricity in Japan is 0.476 t- CO2 / MWh (receiving-end CO2 emissions basic unit for FY2011 announced by the Federation of Electric Power Companies of Japan). The other conversion factors are from the Act on the Rational Use of Energy and the Act on Promotion of Global Warming Countermeasures. Local emissions coefficients for China, Taiwan, and the Philippines were used for the CO2 emissions coefficients from electricity in other countries. *3:Among substance covered in the Act on Promotion of Global Warming Countermeasures, we use the term "greenhouse gases" to refer to these seven substances: PFC（CF4,c-C4F8）,HFC（CHF3, C2HF5）, SF6, NF3 and N2O. We use AR4 for the global warming potential. *4:Within Japan, this refers only to emissions of the 38 priority controlled chemical substances designated by JDI, and overseas it refers only to emissions of VOC.